I have a really hard time explaining just how much I love this series, how incredibly great it is (from the beautiful writing, to the amazing pack of characters, the laughing-out-loud kind of humour, the fascinating world and the too-awesome-to-be true plot-line). You see, it’s just that I can make a clear distinction between those books, I can separate them in my mind, I can tell which one I liked better and which one I didn’t and why. But here, I feel like this is just ‘one big story’ that flows easily from one ‘part’ to another and I can only tell you that I love it to pieces – all of it. Because, yes, there are other characters that give name to the books, but the story is the same: the story of Cinder and the great people helping her. And it’s their journey as a whole that takes my breath away, them as a group that stole my heart.. This being said.. Where’s the next book? Where’s the next book?! Who doesn’t feel like being saved by a ‘Prince Charming’ of sorts every once in a while? Who doesn’t want to be loved and cared for like these guys try in this story? I might be that person, just from time to time. And to be honest I find it hard to choose between them, as they are all so great. Of course, I love Kai – even though the story seems to be more about Cinder than about him (I loved where the story left them – I’ve been waiting for that for quite a while). He seemed to be the only one left totally in the dark when it came to Cinder and I was holding my breath for the moment they got to see each other again. Talking about eyes and darkness, isn’t Thorne just as sweet when he is so vulnerable and totally in the open like in this book? He is probably my favourite just because he is so funny and cute – though in this one he was pretty clueless (his relationship with Cress was lovely if only by ‘not being‘. For someone who flirts with everyone he really didn’t seer this girl at all – no pun intended, or maybe just a bit). I have no clue about Jasin – I guess he will be Winter’s saviour or something, but I could barely read him in this book. I know that he wants to protect her, I just hope he won’t go against all the others in order to do it. As for Wolf, well, he was pretty heartbroken (poor him, he knew exactly what dangers awaited for his loved one), so there was not much development when it comes to him. I was actually not that fond on him while reading Scarlet, though in his own and personal novel won me over (my oh my). Once upon a time.. Scratch that, I’ll save myself! Yes, that’s right.. They are strong, they are confident, they are making the best of all situation – even if they don’t actually know it. Cinder is as great as always – she makes mistakes, but she cares about her team and doesn’t want them to get hurt. She is in pain every time another crew member suffers and sometimes all she wants is to take a break from this all. But that’s not an option for her, so she just keeps going, and she does it pretty well. Scarlet – oh poor scarlet, we have less of her POV in this book, but I think we’ll get more in the next one, as she is right were we need her to be. Keep holding on dear, rescue is coming! Cress – she is sweet, she is too naive for her own good, she is a hopeful romantic and she often mistakes her fantasies with reality, but she has such a great heart and she has a lot of courage. She’s been through a lot and I loved to see her change – for someone who’s lived all her life in solitude it is no wonder that she is so out-of-place in most situations, but she manages it pretty well. Iko – i can’t omit her, as she is extremely funny and caring. This book would not be the same without her, really. Am I the only one that didn’t see this as a love story between Thorne and Cress, at least not for now? Because there was romance between Cinder and Kai in the first one, there was romance between Scarlet and Ze’ev (aka Wolf) in the second one, but here.. How can I say it best? They are not here to sweep you off your feet.. yet. Thorne’s second nature is to flirt. And he can’t really put the finger on the difference between flirting for the sake of it and actually saying what you feel. 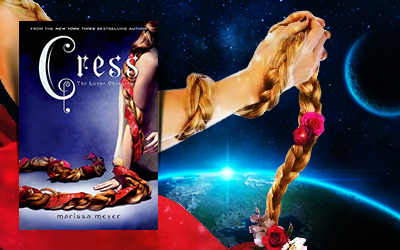 Cress on the other hand has lived with the hope that one day she will be saved by her “Prince Charming” and she was so sweet in her naivety. And it was so much funnier when Thorn didn’t take seriously her fairytale ramblings. Really, they were hilarious! So yeah, they are sweet, both of them. At some point they might make a great couple with the “opposites will attract” thingy they have going on. I also love them to pieces. But what they’ve had in this book was just the beginning. Don’t go assuming this will be a romance, you don’t want to be disappointed. I, on the other hand, am here for ALL the characters (you know my one-long-story-split-in-4-books theory already), I enjoy watching their stories blend together and probably this is why I liked this series so much. You don’t follow one pair of characters, you follow them all, you love them all, you can’t wait for ALL of them to get to their happy endings. And also, I had a lot of fun with the misunderstandings between Thorne and Cress and I wouldn’t change anything at all. Where’s the NEXT ONE ?!!! I love, love, love this review! I’m still waiting for my copy to arrive, but I can’t wait to read it! I need more Kai… and Thorne… and Wolf… okay, I need them all! Oh, Lis, I really hope that you will actually love, love, love the book too 😀 This series is just amazing! I know.. I love all these books so much too. I need to read this and soon ♥ The other two were amazing! 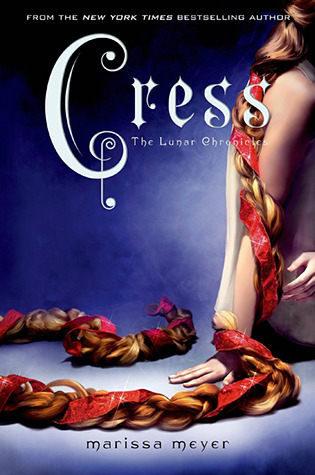 Do I read fairest or winter after Cress?